PLANNED AS A PARKWAY: In 1932, the Regional Planning Federation (the predecessor agency to the Delaware Valley Regional Planning Commission) proposed a parkway system around the Philadelphia area similar to that constructed by Robert Moses. Like the Moses parkways in New York, the four-lane parkways were to feature controlled access, stone-arch bridges, timber lightposts and natural vegetation. The plan proposed a parkway extending from the Benjamin Franklin Bridge approach in Camden southeast to Atlantic City. The Camden-Atlantic City parkway was to have been constructed along the North-South Freeway (I-76 / I-676 / NJ 42) and Atlantic City Expressway alignment. However, without a forceful "power broker" such as Moses to direct public works projects in the Delaware Valley, the route remained a dotted line through South Jersey until after World War II. LINKING THE ATLANTIC CITY EXPRESSWAY TO PHILADELPHIA: In the late 1940's, the New Jersey State Highway Department proposed the North-South Freeway, a link that was to connect the eastern approach of the Benjamin Franklin Bridge with southern New Jersey points. Construction of the NJ 42 Freeway took on greater importance with the 1953 announcement of the construction of the Walt Whitman Bridge. Right-of-way acquisition began in the early 1950's, and construction of the first sections of four-lane freeway soon followed. The first 4.3-mile-long section of the NJ 42 Freeway, between the I-295 / I-76 junction in Bellmawr and NJ 168 (Black Horse Pike) in Blackwood, opened in 1958. One year later, the remaining 3.8 miles of freeway south to the Atlantic City Expressway / NJ 42 junction in Turnersville was opened to traffic. With the completion of the I-76 and NJ 42 sections of the North-South Freeway, motorists now had an 11-mile express route between South Jersey and Philadelphia. The 1965 completion of the Atlantic City Expressway extended this continuous controlled-access route to Atlantic City. In anticipation of the completion of the Atlantic City Expressway, the state widened the existing NJ 42 Freeway to six lanes, and near the I-76 / I-295 interchange, to eight lanes. The additional lanes were constructed within the median of the freeway. 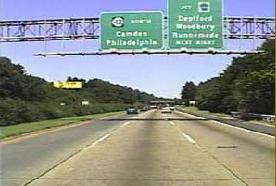 In 1985, the NJDOT completed a new interchange with the NJ 55 Freeway in Deptford. The NJ 55 Freeway, which was completed south to Port Elizabeth in 1989, provides access to Cape May County. DESIGN SPECIFICATIONS: Carrying more than 85,000 vehicles per day (AADT), the NJ 42 Freeway is constructed to contemporary highway design standards. In its original design, the expressway was constructed with four 12-foot-wide lanes, 10-foot-wide shoulders, and 1200-foot-long acceleration and deceleration lanes. To accommodate the additional traffic spurred by new suburban development and the opening of the Atlantic City Expressway, the state widened and resurfaced the entire length of the NJ 42 Freeway from four to six lanes in 1965. Beginning in 1996, the NJDOT widened the NJ 42 Freeway from six to eight lanes between the I-295 / I-76 interchange in Bellmawr and the NJ 55 Freeway junction in Deptford. The widening project was completed in August 1999 at a cost of $35 million. The speed limit along the entire length of the NJ 42 Freeway is 55 MPH. UNTANGLING THE NJ 42 / I-76 / I-295 MESS: As early as 1985, the NJDOT began studies of rebuilding the interchange between I-76, I-295, and the NJ 42 Freeway in the Borough of Bellmawr. The present interchange, which carries approximately 200,000 vehicles per day (AADT) between the three roadways, does not permit a direct connection for I-295 through traffic. These motorists must negotiate 35 MPH hairpin curves (nicknamed the "Al-Jo" curves after a tavern formerly located on the site of the interchange) to stay on I-295. Motorists traveling between I-295 and I-76 / NJ 42 Freeway have their own problems of weaving, tight curves and missing movements (especially between points west and south). These substandard conditions have been the cause of hundreds of accidents each year since the interchange was completed in 1961. The NJDOT announced preliminary plans to rebuild this interchange in 2000. The rebuilt interchange would have one or more elevated highways designed to straighten out the current snarl at the interchange. Through-traffic movements would be realigned and redesigned for a maximum design speed of 60 MPH, and new and rebuilt ramps would be constructed. Engineers selected 16 different design alternatives for the rebuilt interchange. A 2004 draft environmental impact statement narrowed the number of alternatives down to five. In 2007, the NJDOT selected "alternative D" for the interchange, which features a six-lane elevated roadway to carry I-295 over I-76 / NJ 42 at a posted speed of 55 MPH. Existing ramps will be redesigned to current safety standards, and the "missing moves" ramps (northbound I-295 to southbound NJ 42, and northbound NJ 42 to southbound I-295) will be built south of the existing interchange. The rebuilt interchange would resemble a "double-directional-T" interchange. Final engineering and design work is expected to continue through 2009, with construction slated to begin in 2011. The NJDOT expects the $450 million project to be completed by 2015. ADDITIONAL IMPROVEMENTS: During the early 2000's, the NJDOT undertook a $13 million project to rebuild EXIT 12 (Gloucester CR 544) and EXIT 12A (NJ 41) in Deptford Township. Ramps were rebuilt to improve circulation at both interchanges. The NJDOT plans to build a new EXIT 7A at Gloucester CR 673 (College Drive) in Gloucester Township. Design alternatives and scoping sessions are planned for the interchange proposal, and if approved, the $16 million project would begin in 2009. To raise the profile of South Jersey, the North-South Freeway (NJ 42) and the Atlantic City Expressway should be designated I-76. This designation would underscore the importance of this route from the Atlantic Ocean to the Midwest. Exit numbering on the extended I-76 thus would begin at the Walt Whitman Bridge and continue southeast to Atlantic City. The existing NJ 42 Freeway should be widened to ten lanes from I-295 in Bellmawr south to the NJ 55 Freeway in Deptford, and widened to eight lanes from the NJ 55 Freeway south to the Atlantic City Expressway / NJ 42 junction in Turnersville. Some bridges may have to be reconstructed as part of the project. SOURCES: Regional Plan of the Philadelphia Tri-State District, Regional Planning Federation (1932); "Philadelphia's New Shore Route" by William J. Weart, The New York Times (4/21/1957); "Bridge Is Opened at Philadelphia" by William J. Weart, The New York Times (5/16/1957); New Jersey Highway Facts, New Jersey Department of Transportation (1967); 1985 Regional Transportation Plan, Delaware Valley Regional Planning Commission (1969); "South Jersey Commuting Could Be Worse" by Bernie Weisenfeld, The Courier-Post (5/28/1999); "Relief Proposed for Traffic Headache" by Jason Laughlin, The Courier-Post (4/21/2000); "New Jersey Promises To Untangle a Traffic Knot" by Jennifer Moroz, The Philadelphia Inquirer (11/24/2004); Michael G. Koerner; Raymond C. Martin; Christopher G. Mason; Dan Moraseski; Brian Polidoro; Jeff Taylor; William F. Yurasko. NJ 42 shields by Ralph Herman. NJ 42 exit list by Ray Martin.